Floral decorations match artwork on the walls at garden club exhibit. 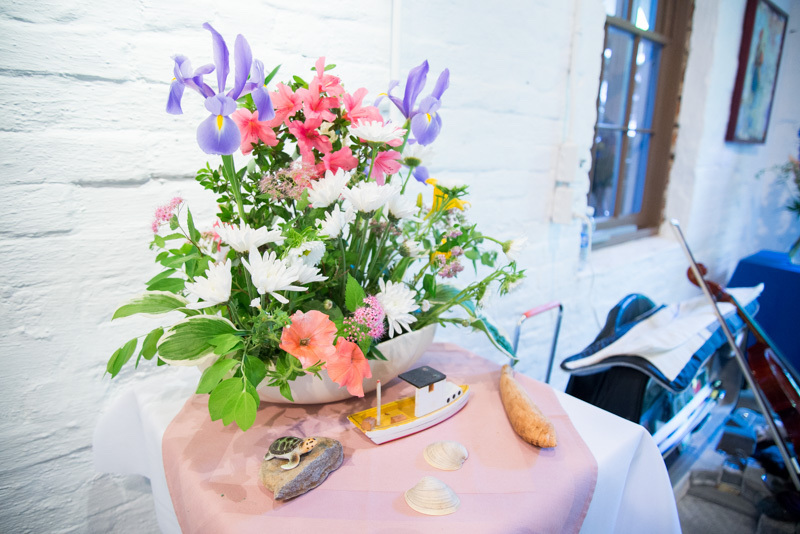 “The gallery is based on the Museum of Fine Arts in Boston,” said garden club president Tracie Clark, referring to the MFA’s Art in Bloom exhibit. A large crowd poured on to the Old Mill lawn for the joyous occasion. The number of contributing artists increased to 42 this year from 36 last year. 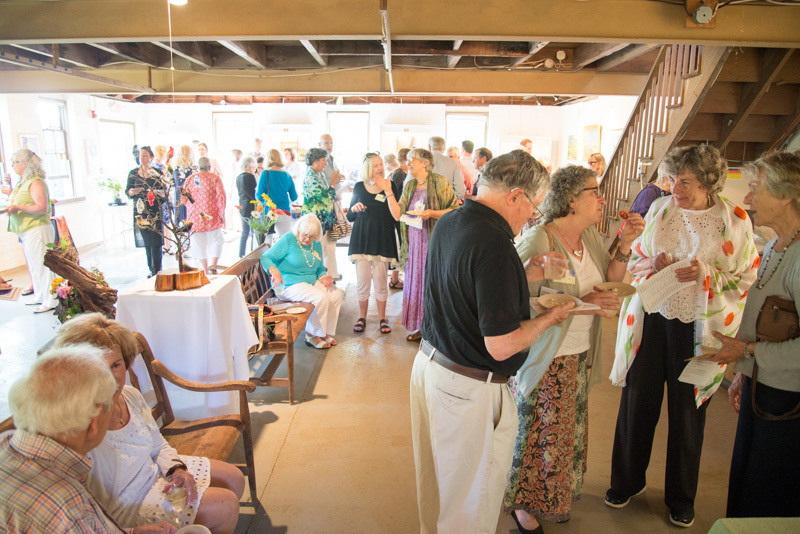 The Old Mill preservation and Garden Club scholarship funds receive all proceeds from the event. The garden club and its 200 members work to sustain the environment through a shared passion for gardening. The group meets monthly and organizes events such as the Garden Club Annual Plant Sale on Memorial Day Weekend. Program committee co-chair Angela Egerton designed the gallery’s layout prior to the event. Assigning each work of art with a floral arranger, the committee co-chair meticulously matched the size and color of a painting according to the design of the Old Mill’s newly-lit gallery walls. “It’s kind of a random choice on choosing and passing out pieces of the artwork a month before the show happens,” explained Ms. Egerton. Setting up the final product proved more difficult. “It takes a lot of time because I like to lay it all out and make sure it coordinates with everything else,” she added. Astrid Tilton, a graduating senior from the Martha’s Vineyard Public Charter School, was this year’s recipient of the garden club scholarship, which is awarded to students demonstrating achievement in horticultural or environmental studies. Ms. Tilton worked with the Martha’s Vineyard Conservation Society to draft a plastic bag bylaw on the Island. She plans to study photography and environmental policy next year at Hampshire College. “I just did a series of plastic bag photos at the West Tisbury Library and at the A Galley as well,” she said at the reception. The evening’s silent auction featured Ms. Egerton’s hand-drawn piece The Old Mill along with Margot Datz’s Waiting for her Ship to Ship In. 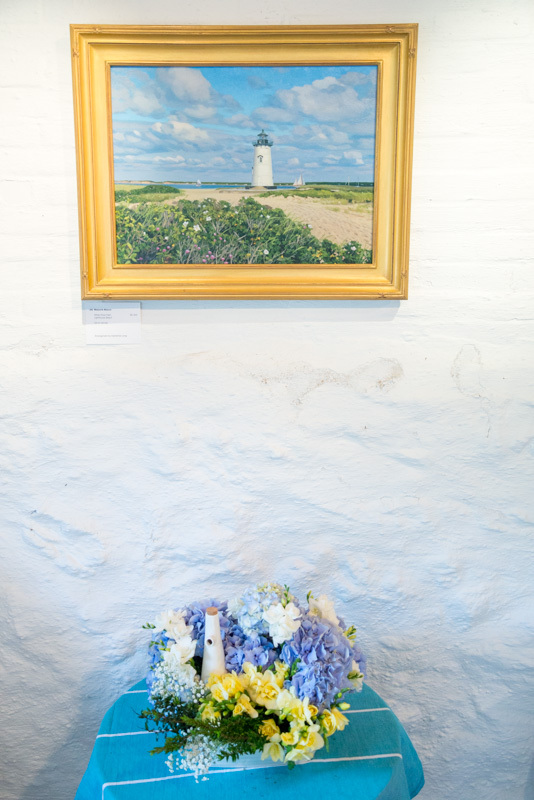 The Blooming Art exhibition continues this weekend on Saturday, June 25 from 10 a.m. to 5 p.m. and Sunday, June 26 from noon to 3 p.m. at the Old Mill in West Tisbury. More photos of Blooming Art 2016's opening reception.